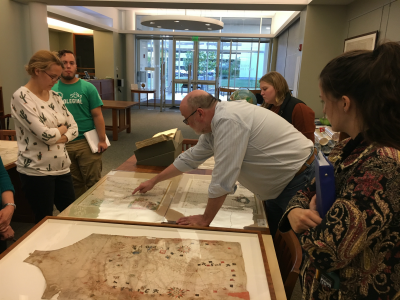 On October 3, 2018, students from Professor John Muthyala’s English 370: Literatures of Discovery, Exploration, and Colonialism met in the Osher Map Library and Smith Center for Cartographic Education to study maps and atlases about the encounter between Europe and the Americas, starting in the fifteenth century. Matthew Edney, Osher Professor of Cartography and Professor of Geography, led a discussion about how travelers to the Americas struggled to understand its newness and strangeness, even as they sketched, drew, and mapped the spatial and temporal coordinates of what has come to be called the New World. The activity of mapping is often marked by political desire and territorial acquisition, said Professor Edney. 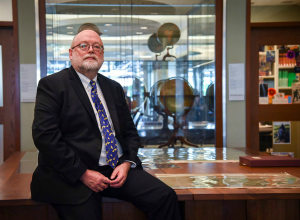 With extensive experience in curating exhibitions, editing collections, and writing books, Professor Edney discoursed freely on Medieval myths, early modern nautical technologies, and Renaissance humanism. In addition to showcasing several maps and drawings, he highlighted the Cantino Planisphere, which details the contours of Africa and India (one of the first sixteenth century maps to do so), while also showing the parts of the Americas occupied by the Portuguese. In this course, students study the writings of Christopher Columbus, his physician, Dr. Chanca, Bernal Díaz Del Castilo, Hernán Cortés, Jean de Léry, and several others, including Guaman Poma de Ayala, an Andean noble who wrote a long letter (around 1200 pages and 398 drawings) to King Phillip III of Spain about the conquest of New Spain (it was digitized by the Royal Library in Copenhagen, Denmark, in 2001). The aim is to study how a new discourse of the New World emerged in the so-called Age of Discovery. Columbus, pointed out Professor Edney, mixed up marine charting with geographical mapping, believing that he did discover a new route to the Indies, which is why he called its inhabitants “Indians. 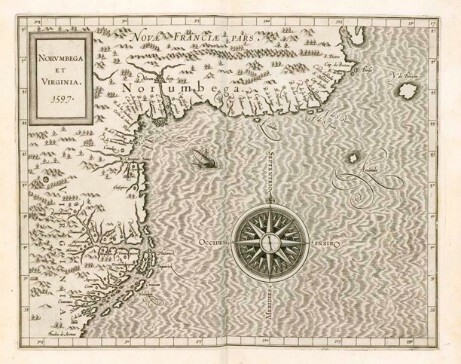 ” However, it was Amerigo Vespucci, not Columbus, who understood the cartographic significance of the newly discovered land: it was not the edge of the Far East, but a huge landmass separating Europe from Asia. This landmass would eventually be marked by an iteration of Amerigo—America. Far from being an esoteric subject, the literatures of the New World, observed Professor Muthyala, are relevant to the politics of discovery, whose contemporary manifestations have recently included defacing statues and commemorational objects of the Italian voyager. Last year, in 2017, the City of Portland, Maine, voted to mark the second Monday of October not as Columbus Day but as Indigenous Peoples’ Day; clearly, the meaning of “America” is still up for debate and understanding. 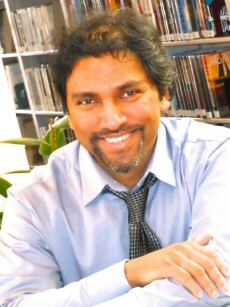 Professor Muthyala, who leads the Digital Humanities Initiative at USM, added that studying maps and making connections to New World discourse also involves generating research that is multimodal: new knowledge incorporating multiple modes of composing. It means using more than one of the five modes that the New London Group identified as central to meaning-making: linguistic, visual, aural, spatial, and gestural. Such an approach is a key feature of the Digital Humanities, which uses digital tools to enhance humanities oriented research and creativity, while also applying humanities approaches to study digital products and culture. In this course, for the final project, students have the freedom to experiment with digital tools and devise projects that incorporate multimodality. 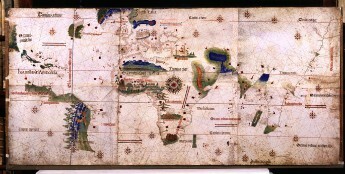 “Cantino planisphere,” (1502). Biblioteca Estense, Modena, Italy. Cornelis Wytfliet, Norvmbega et Virginia 1597, in Descriptionis Ptolemaicae augmentum (Louvain, 1598). Osher Map Library and Smith Center for Cartographic Education, University of Southern Maine (Smith Collection).